A cold, sprayed-on coating that can transform most materials to look, feel and act like metal. These are manufactured by spraying or casting. VeroMetal is set to make your products stand out from the crowd. The 95% metal coating can be applied to intricate edges, complex curves, into hollow spaces and used on an array of materials. By using VeroMetal you can achieve similar characteristics of a solid metal without the expense. 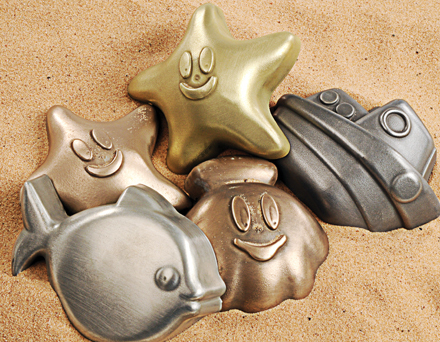 VeroMetal offers sprayable metal surfaces which consist up to 95 % of metal powders. A mixture of metal powder and binder + hardener is resulting in a cold liquid metal (composite metal) which can be applied by casting or a special spray process to nearly every surface. After the drying process, the surfaces show similar properties as cast metal. Through this process you create a strong and durable metallic surface. Shape and design details of the coated objects remain as the original pieces show them. The object however shows metallic structures. As real metal the coating is long-lasting and resistant to strain. Metal types: Aluminium, Iron, Stainless-steel, Brass, Bronze, Copper, Zinc, Tin, Nickel-Silver, Reflex S01 and Gunsmoke.